Judy Blume will be speaking at the University of Hartford on June 21st as a fundraiser for The Mark Twain House & Museum. I’ll be interviewing her onstage and taking tons of audience questions. In preparation, I will be reading her complete works and blogging about the experience. Get your tickets here. This is it. This is it! I have now read the collected works of Judy Blume. In a way, this feels like going back to the beginning. These are four little chapter books roughly at the same reading level as The One in the Middle is the Green Kangaroo. They are an expansion of that Free to Be You & Me picture book, the Pain and the Great One. All four of these books depict little childhood episodes: wolfman masks, getting lost in the mall (in New Jersey this is almost a rite of passage), dogsitting, failed birthday parties, mean cousins, and chasing boys around. What can I say? They're Judy Blume books. The kids are younger, the concerns more childish. Pitch-perfect for that stage of life. I love that The Pain and the Great one was originally written for Free to Be You and Me. Because at heart, that's what all of this work is about. Being who you are. Seeing things from your own distinct point of view, but knowing there's another completely different way to see it. Knowing that life is hard on every side of the fence. 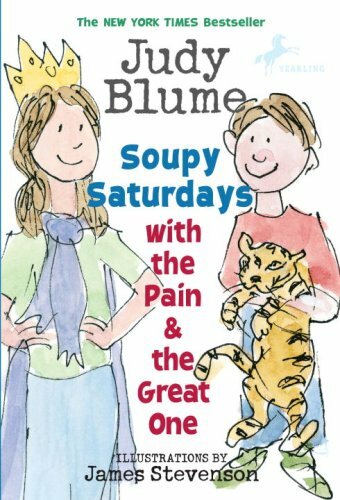 I expected that these books will be a silly little denouement from the more "serious" Judy Blume books. I expected to be disappointed that these were the end of my project. But instead, I lay in bed, laughing a little and thinking, "yes. That's exactly how it felt."